Afternoon stop at Ship Channel Cay where we will encounter the wild Exumas pigs. See for yourself why celebrities are drawn to the beautiful white sand beaches of the Exumas, Bahamas. On this tour you will enjoy an exciting ride on a powerboat, meet some of the native wildlife, and enjoy the sun and water of the Caribbean. The Exumas consist of more than 360 islands. For many years, the islands were home to the Lucayan Indians, who were entirely enslaved in the 1500s. With the exception of an occasional pirate ship, the islands sat virtually vacant until the 1700s, when they were rediscovered by American Loyalists during the Revolutionary War. Today the islands remain fairly secluded and have become vacation spots for celebrities. 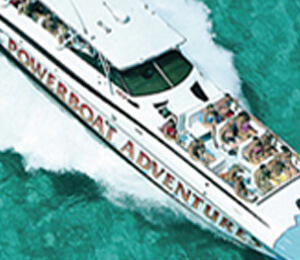 You will depart Nassau on a high-speed powerboat. Feel your adrenaline rush as the boat slices through the water at 40 miles per hour. Our first stop will be the remote paradise of Allan's Cay. This island is home to the endangered Allan's Cay Rock Iguana. The colorful lizards are also known as Bahamian Dragons. These friendly creatures will be happy to make your acquaintance, especially if you have grapes to share with them. After all of the pictures have been taken, you will climb aboard the powerboat to head to the second destination, the Ship Channel Cay. You will be awed by the views from this secluded island. You can snorkel along the beautiful coral gardens that surround the island. The shallow water around Ship Channel Cay is home to a friendly family of stingrays. These creatures love to be fed. The food also attracts another species of marine life nurse, reef, and lemon sharks. While our guides feed the sharks, you will have the opportunity to snap photographs. While you are enjoying the water and the sand, we will be fixing a special lunch of fish stew, fresh salads and breads, grilled steaks, tropical fruit, and other scrumptious treats. The open bar will be available throughout the day. You'll find that the Exumas are just the spot for water, sun, and relaxation. Will I see swimming pigs with this tour? Yes, we make an afternoon stop at Ship Channel Cay where we will encounter the wild Exumas pigs. Is food provided on this tour? Yes, lunch is provided to you on this tour. What is included in the lunch buffet? The lunch consists of sandwiches, chips, salsa, fruits, and salads. PRINTED email confirmation, towels, sunglasses, hat, and sunscreen. I have been to the Bahamas many times, but Exumas Powerboat Adventure is one of my favorite trips! It includes everything that everyone should do here. As a Bahamas veteran, I can say only the best about this experience!